Image courtesy of Powerhouse Books. 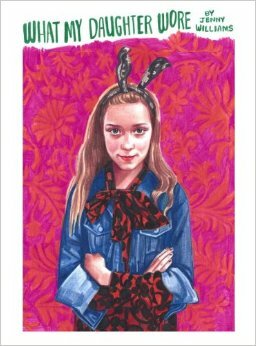 Just published is a unique fashion book by Brooklyn artist Jennifer Williams, What My Daughter Wore (Powerhouse Books). Like many a tween girl Ms. Williams’ daughter, Clementine, began playing with fashion. Inspired by the creativity, Ms. Williams began illustrating Clementine and some of her friends. Soon after she started a blog, which in 2013 was named by Time magazine one of the 25 Best Blogs. Like all popular blogs it’s now a book. I remember fondly my own young years tiptoeing into fashion. It’s a specific period of style exploration when we can get away with just about anything (that’s still tasteful) from playful irony to political statement. Ms. Williams captures this moment in time, which is never the same generation to generation.